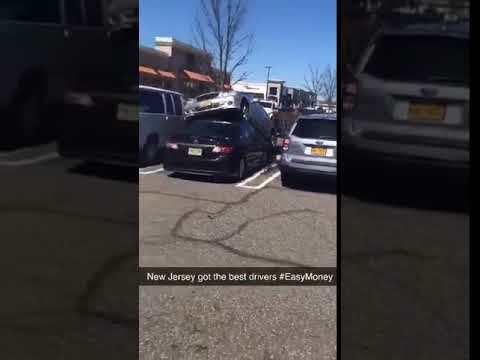 PARAMUS, N.J. -- A wild pursuit through several Bergen County towns that included a police car crash in Paramus ended Wednesday afternoon when the driver -- an ex-con involved in a similar incident a little over a year ago -- crashed again on the Turnpike in Essex County, authorities told Daily Voice. Holden tried to pull the car over, but Vizzone kept going, he said. "When the Jetta reached the Lukoil Gas Station, located on Route 17 south near Farview Avenue, it jumped a curb, struck a civilian car, then fled onto Gertrude Avenue," Ehrenberg said. Vizzone then steered into the Coach USA bus yard on Pleasant Avenue before heading into a Paramus Honda storage yard, where the Jetta hit three parked vehicles, the chief said. After pulling to a stop in the lot, the driver "got out and went to run, but then he turned around and got back into the car," another law enforcement officer told Daily Voice. He then fled into a storage yard belonging to Paramus Honda also located on Pleasant Avenue. "The suspect then rammed two Paramus police cars, causing significant damage to one of them," Ehrenberg said. An officer was taken to Hackensack University Medical Center with neck and back injuries and was expected to be released, he said. Vizzone, he said, drove through a chain link fence and locked gate, got back onto Pleasant Avenue and sped off on Passaic Street through Maywood into Hackensack. At one point, he turned onto State Street -- right past Hackensack police headquarters -- and then onto eastbound Route 80, headed for the southbound Turnpike. Hackensack and New Jersey State Police picked up the chase, which eventually ended with a crash into another civilian's car near Exit 15 W, Ehrenberg said. Vizzone "was taken into custody by the State Police and the officers of the East Rutherford Police Department," he said. He was then taken to the Paramus Police Department, where he was booked, processed and charged. A judge ordered Vizzone held in the Bergen County jail pending a bail hearing. He's charged with reckless endangerment, eluding police with a motor vehicle, violation of parole and criminal mischief, Ehrenberg said.